Short priced favourite Redzel highlights the first acceptances for the Group 1 $2.5m Darley T J Smith Stakes (1200m) at Randwick on April 7. Redzel, above, is among the first acceptances for the 2018 T J Smith Stakes at Randwick. Photo by Steve Hart. 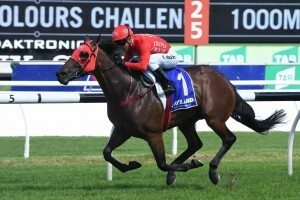 The Peter and Paul Snowden trained Redzel in the $2.70 favourite at Ladbrokes.com.au and along with his stablemate Pariah, is included in the thirty-nine first acceptances for the Group 1 weight for age sprint on the first day of The Championships. Redzel was a winner over the same course and distance as the T J Smith Stakes when he scored a brilliant win in the $10m The Everest during the 2017 Sydney Spring Carnival and then went on to win the Group 1 $1m Darley Classic (1200m) at Flemington on the last day of the 2017 Melbourne Cup Carnival. The five year old’s winning run came to an end when he suffered his first defeat in seven starts when a nose second to Redkirk Warrior in the Group 1 $750,000 Black Caviar Lightning (1000m) at Flemington on February 17 but then he bounced back into the winner’s stall with victory in the Group 2 $500,000 Hyland Race Colours Challenge Stakes (1000m) at Randwick last Saturday. One of Redzel’s main rivals will be the Team Hawkes trained Chautauqua who is the winner of the last three runnings of the T J Smith Stakes but the grey flash has hit a hurdle and has been ordered to barrier trial before he can race again after refusing to jump on three consecutive occasions from the starting gates at recent barrier trials. The Hawkes Racing Team of John, Wayne and Michael has switched Chautauqua’s preparation to Melbourne and are hoping to have him passed by the stewards before returning to Sydney to run in the T J Smith Stakes. Chautauqua is currently listed on the fourth line of betting at $11 with the Ben Smith trained In Her Time at $8.50 and the Lindsay Park trained Vega Magic at $9 sandwiched in between Redzel and Chautauqua in the market order. The Lindsay Park Team of David and Ben Hayes and Tom Dabernig also have Derryn, Fuhryk, Spieth, Thronum and Tulip among the first acceptors for the T J Smith Stakes. The final field for the 2018 T J Smith Stakes will be released on Tuesday, April 3. Early betting for the 2018 T J Smith Stakes at Ladbrokes.com.au: $2.70 Redezel, $8.50 In Her Time, $9 Vega Magic, $11 Chautauqua, $15 Ittetsu, Viridine, $17 English, Trapeze Artist, $21 Jungle Edge, She Will Reign, $26 Clearly Innocent, $34 Hey Doc, Secret Agenda, Supido, $41 or better the rest.